Broadcaster ESPN is reporting that LeBron James will announce his NBA plans on its network Thursday night in an hourlong special. ESPN's Chris Broussard is reporting Tuesday night that James' "representatives" contacted the network and asked for the unusual arrangement. Broussard reports ESPN officials confirmed the request but added the network was not told what James' decision will be. At least one blogger hopes James will not join the New York Knicks. 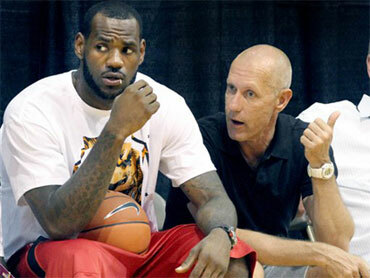 Both James' publicist Keith Estabrook and ESPN spokesman Josh Krulewitz declined comment to The Associated Press. James is believed to be considering staying with the Cleveland Cavaliers or joining the Miami Heat, Chicago Bulls, Los Angeles Clippers, New York Knicks or New Jersey Nets. James made news earlier Tuesday when he opened a Twitter account. News about his future in the NBA has been mostly speculative. He visited his summer camp in Akron, Ohio, Tuesday.